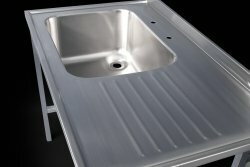 Our freestanding stainless steel sinks offer complete installation flexibility to be sited anywhere very quickly, and are fully customisable to to suit any application. 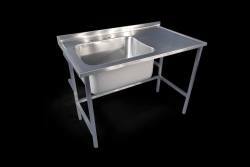 Our freestanding stainless steel sinks are completely bespoke and can be manufactured in chemical resistant 316 grade stainless steel to make them suitable for laboratory installations, or from food spec 304 grade stainless for catering, healthcare and commercial environments. In addition to the inclusion of a wide range of standard or fully bespoke bowls, there are also a wide range of options available for our free standing sinks including versatile storage options for the under frame, including end panelling, cupboards and drawer units. The beauty of these independent sink units is that they are be installed in a matter of minutes, requiring no separate support structure to be built beforehand. Separate height adjustable feet are also easily set to account for uneven floors, or to ensure the sink top meets adjacent units. These units work extremely well across a number of sectors, from commercial and domestic kitchens to school food technology rooms, laboratories, healthcare practices and veterinary surgeries, providing robust and convenient clean down and wash up facilities with the minimum off effort. All our free standing sink units are manufactured to the highest standards to ensure decades of trouble free performance and are back up by our standard 25 year warranty*. Please take a look at the relevant industry section, for more information on the wide range of tables we can supply. * See warranty terms and conditions. For a more mobile unit, opt for lockable castors – ideal where you need a flexible work space, or a unit that can easily be moved for proximity to workers. See also our trolleys and tables useful alternatives where an integral bowl isn’t require, especially practical for surgeries, laboratories and kitchens. Get in touch today, to discuss your requirements. Our laboratory tables are made from 316 laboratory-grade steel. This premium metal is resistant to harsh chemicals and extremes of temperature. It also boasts inbuilt antibacterial properties – making it ideal for germ control, especially in a clean-room environment. What’s more, because our tables are fully welded, there are no joins in which bacteria can gather and multiply; this seamless finish is not possible with any other material, including Trespa. Our laboratory products are made to such a high specification that they are used in many top industrial and academic laboratories. They are the cost-effective solution for your project, as the metal’s extreme impact-resistance and durability mean your tables will last for decades. add lockable castors in place of standard feet, for a mobile unit. Take a look at our other products for laboratories, including worktops, sinks, hand-wash basins, fume cupboard liners, trolleys, cupboards and shelving. We also have the facilities to fabricate products that are not shown on our website – simply get in touch, to discuss your requirements. Our bespoke tables for surgeries, hospitals, clinics and dental practices are made from premium, 304 food-grade stainless-steel, which is compliant with all current Health & Safety and Food Hygiene regulations. They are the most hygienic choice for your healthcare environment, as the steel boasts inbuilt antibacterial properties which make it difficult for bacteria to latch on to the surface. This, together with the fact that all joins are fully welded for a seamless finish, means that only the minimum of care is needed, in order to maintain the bacteria-free environment essential for the wellbeing of your clients. the option of 316 laboratory-grade steel, for laboratories and clean-rooms. Thanks to the robust features of the steel, the tables will outlast all other materials, including Trespa. Our range also features a wide number of other products for the healthcare arena, including: shower trays, hand-wash basins, sinks (including plaster sinks), fume cupboard liners, worktops and trolleys. Get in touch today, to discover how we can create the products you need for your surgery, hospital or other healthcare practice. Whether you are sourcing a table for food preparation in a nursery kitchen or a school food technology room, or to provide a chemical-resistant work surface in a laboratory, our bespoke tables can be fabricated to fit both the application and the situation. Our kitchen tables are made from high-quality, 304 food-grade steel, which meets all current Food Hygiene and Health & Safety regulations. Our laboratory units are fabricated from premium 316-grade steel, which is resistant to harsh chemicals. Both metals are robust, durable, ultra-hygienic and astonishingly durable – they will last for decades, making them the budget-friendly choice for your project. optional under-table shelving or cupboard – with or without doors. As well as our range of bespoke tables, we offer a large number of products for the academic environment. We have more than fifty years’ experience of furnishing commercial kitchens, classrooms and entire laboratories. Get in touch today, to discuss the specific requirements for your project. 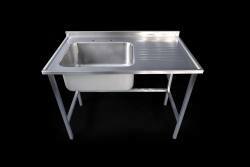 Stainless steel presents the most hygienic and durable option for your commercial kitchen. With its inbuilt antibacterial properties and wipe-clean surface, our premium 304 food-grade steel complies with all current Food Hygiene and Health & Safety regulations. Our stainless-steel tables are also heat resistant – dishes can be placed on them straight from the oven. optional, lockable castors, for a flexible workspace. Why not commission an entire commercial kitchen from us? We pride ourselves on our fully bespoke service, fabricating shelving, trolleys, cupboards and worktops with integrated sinks and hand-wash basins. Once an order is placed, we always meet our deadlines – so you can be sure of having all products delivered on schedule. All of our bespoke items are made from high-quality steel that will last for decades. Contact us today, to find out how we can supply a wide range of top-quality products for your commercial kitchen. Our bespoke stainless-steel tables are the perfect addition to your contemporary kitchen. Offering a gleaming surface that will provide a complement to the most cutting-edge of kitchen designs, our tables can feature either plain, frame-style legs – perfect for an industrial-style room – or they can be adapted to feature under-table cupboards and/or shelves, for a really versatile piece. All of our stainless-steel products are fabricated in our Nottingham factory, so you are supporting British industry when you order from us. What’s more, the raw sheets we use comprise around 60 per cent recycled materials, and the end product is fully recyclable, making stainless steel the environmentally-friendly choice. Available in any size and in an almost limitless range of options to fit your space, our tables are made from high-quality, food-grade steel, which – thanks to inbuilt antibacterial qualities – is the most hygienic material on the market. Whether you need a surface for food preparation, a stunning centrepiece island to make the most of floor space, or a chic mobile storage unit with lockable castors, we can fabricate the exact item your require, to your specifications. The sheer durability of the steel is astounding. In fact, we offer all of our tables with a twenty-five year guarantee*. For a truly stunning design, why not consider an entire kitchen made from stainless steel? We can create the exact products you require, from worktops, sinks and basins to cupboards, shelving, trolleys and plinths. Take a look at our full range – or contact us, to discuss your requirements. *Please refer to the Help and FAQ page, for full warranty terms and conditions. Our stainless-steel examination and surgical tables are the most hygienic option for your veterinary practice. Thanks to innate antibacterial properties, the steel presents a surface to which bacteria struggle to adhere – making it simple to keep clean, and ideal for a sterile environment, such as a surgery. Made from high-quality, 304 food-grade stainless steel, our tables meet all current Health & Safety and Food Hygiene regulations. The metal is also the most robust material available, standing up to the knocks and spillages of a busy veterinary practice. tables for any end-use, including surgical applications. As well as tables, we offer a wide range of other products for your veterinary practice, including: trolleys, worktops, sinks (including plaster sinks and security sinks), hand-wash basins and shower trays. We can even fabricate mobile staircases, to allow large patients easy access to the examination table. Contact us today, to discuss your project.